The Southern Illinois University Edwardsville College of Arts and Sciences (CAS) celebrated the scholarly achievements of more than 220 students with 253 scholarships and awards at its 2017 Honors Day Convocation. The event, held Sunday, April 9 in the Meridian Ballroom, is the largest single gathering recognizing student achievement at SIUE, outside of commencement. Approximately 500 attendees, including students and their family and friends, University administrators, CAS faculty and staff, and award and scholarship sponsors, honored outstanding students pursuing degrees within the College’s nearly two dozen departments and programs. “These students have successfully begun a journey of intellectual transformation that will continue throughout their educational and professional careers, and we are incredibly proud of them,” said Greg Budzban, PhD, dean of the CAS. “Honors Day offers the opportunity to express our deep appreciation to the sponsors of our awards, many of whom were in attendance. “Every one of you has played a part in our academic success,” Juenger told attendees. “Every one of you has been there to fill a void in our moment of self-doubt, with a vote of confidence. The Maryville native received the Edna and Frithiof Carlson Award for Creative Expression in a CAS Discipline, and award open to all CAS students. Juenger also earned the Judy Landers Creativity Award from the Department of Mass Communications. Abbie Fox, a senior studying chemistry, received multiple awards, including four through the Department of Chemistry and one through the Department of Biological Sciences. The Morton native was also honored as Outstanding Student in Science and Mathematics, an award for the “best” student in the programs of biological sciences, chemistry, physics and mathematics and statistics. Fox was selected by the chairs of each department. Three other students achieved awards in more than one department, including Robinson native Willem Devin (philosophy and historical studies), Jacksonville native Susannah Oettle (anthropology and geography) and Chapin native Chase Halsne (anthropology and philosophy). Notably, junior Justin Murray, of Swansea, was honored with four awards through the Department of Music. CAS Honors Day ended with a celebratory reception in the Morris University Center’s Goshen Lounge. 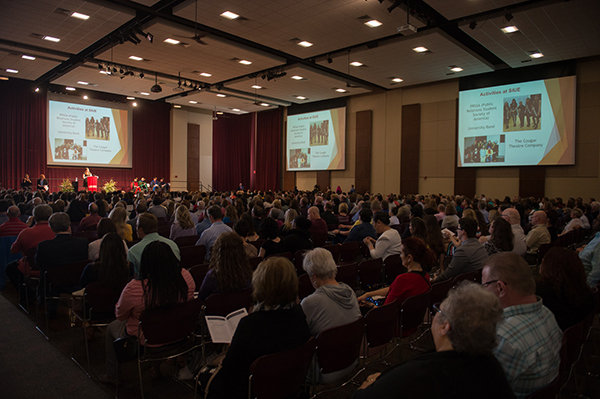 Photo: CAS Honors Day, held Sunday, April 9 in SIUE’s Meridian Ballroom, is the largest single gathering recognizing student achievement at SIUE, outside of commencement. 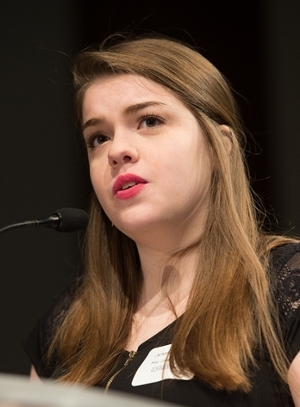 CAS Honors Day student speaker Amanda Juenger, a senior in the Department of Mass Communications.